Chalk it up to convenience. Jon and I were in town for the Indy race but before the morning trip to Barber Motorsports Park, a night of revelry was in order. Focusing our sights on the strip of bars on 29th street, it wasn’t until after our second bar that we decided that finding something for dinner would be a prudent decision. Sadly, Chez Fonfon was reporting an hour wait and Open Table wasn’t being much help. 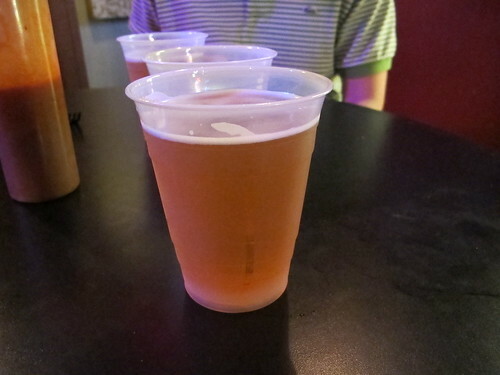 However, it just so happened that a few bartenders had recommended Moe’s Original BBQ as one of the better bbq joints in the city and, lucky us, it was on 29th street. Packed to the gills, it looked like people were at Moe’s more for a good time than bbq but I still volunteered to stand in line while Jon went to find a table. After a short wait, I placed the order and with a few beers in hand, it was just a matter of finding where Jon had claimed a table. It’s always good to try a bit of the local brew; I want to say this was an ipa from Good People Brewing Company. 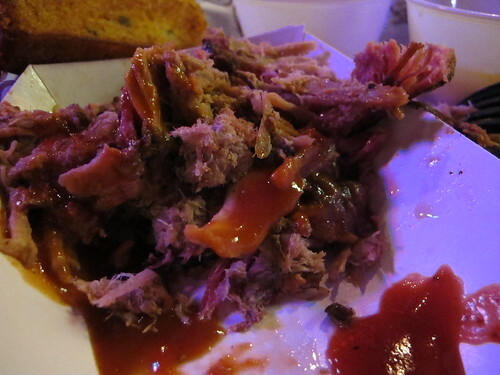 While we watched Kentucky take on Louisville, our order of bbq arrived at the table. 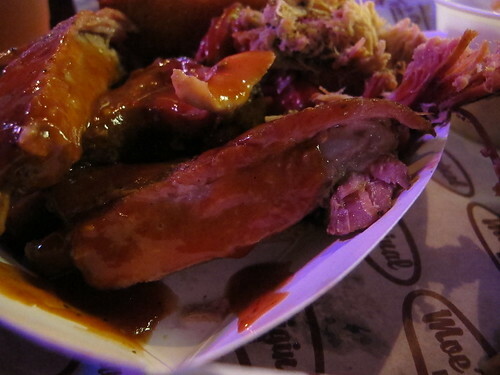 I hoped the combination of pulled pork and ribs would give a good look at how Moe’s approaches bbq. From the first bite, it was obvious that these ribs had been overcooked. Offering no resistance, the meat fell off the bones at the slightest tug. 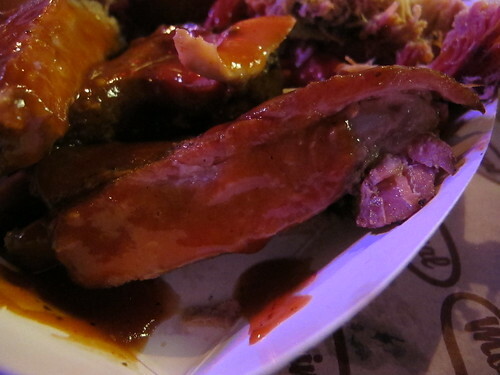 The ribs may have had a slightly chalky texture but there was a nice chili pepper flavor to the bbq sauce. 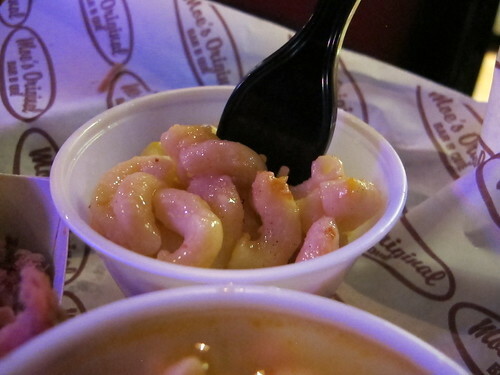 A standard bbq side option, Moe’s mac & cheese was a sight. Lacking any cheese taste, this was simply a cup of oily noodles. After the ribs, I was hoping for better luck with pulled pork. Without any sauce to hide the flaws, this pork was in the same boat as the ribs, chalky and overcooked. Truly good pulled pork shouldn’t require a bbq sauce crutch, but this pulled pork sorely needed it. 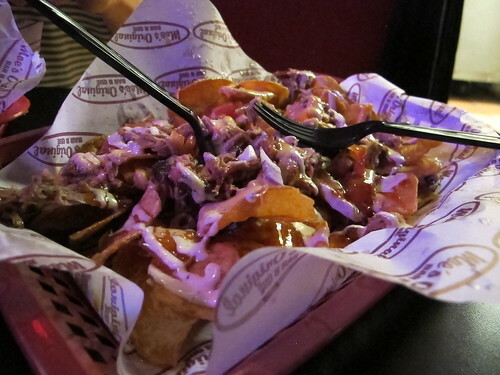 That brings me to the redneck nachos, a dish where Moe’s bbq finally made sense. With this plate, the pulled pork has the aid of a black pepper and chili riddled bbq sauce, thick chips and a variety of toppings. There may not have been enough pork to cover every chip but the cheese, tomatoes, onions, and bbq sauce more than more made up for it. That Saturday night was a perfect illustration of what this Moe’s location is about. The porch was packed, there was band upstairs, and there was line for every table. 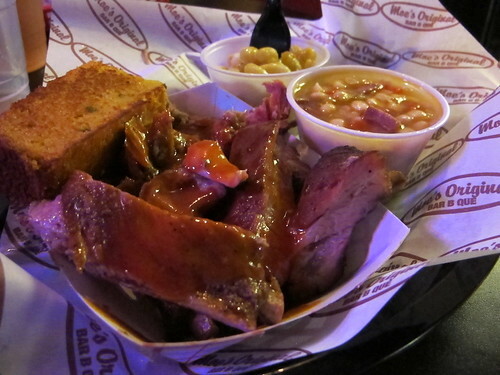 Moe’s Original BBQ is a bar that happens to serve bbq. 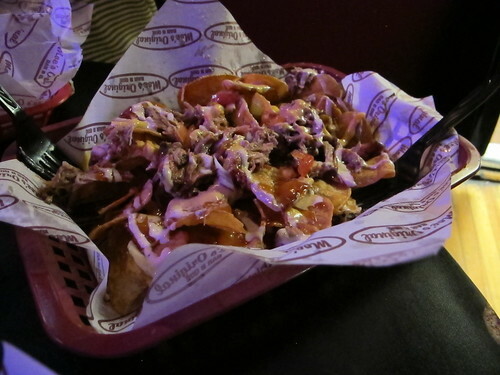 When judged on its barbeque, Moe's is the definition of mediocrity, but put in the context of a busy Saturday night, the beer and redneck nachos are a fine combination.